The Navy’s beloved flight demonstration team is celebrating its 70th anniversary of Blue Angels entertainment on March 12. The Pensacola, Florida-based squadron — with its seven F/A-18 Hornets, three C-130 pilots and more than 100 maintenance and support staff — has undergone some changes lately, adding an executive officer to its line-up in 2014, and the following year, welcoming its first-ever female pilot, C-130 driver Capt. Katie Higgins. It’s also the first season for their new boss, Cmdr. Ryan Bernacchi. Higgins, XO Cmdr. Bob Flynn, Command Master Chief (SW/AW/EXW/IDW) Blake Schimmel and spokesman Lt. Joe Hontz told Navy Times about the squadron’s future in a March 8 phone interview from their Naval Air Facility El Centro, California, training ground. Questions and answers have been edited for brevity. 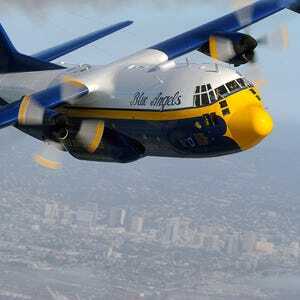 Why were the Blue Angels started? Flynn: It was started in 1946. [Fleet] Adm. Chester Nimitz wanted to keep aviation in the front of the minds of the American citizenry after World War II. He’s the one who was the impetus for creating the Blue Angels. They started with just a few airplanes and they even had some other interesting acts as part of their airshows. And it grew and grew and grew to the present day. Hontz: I think the mission has evolved by us reaching out to people that may not have any interaction at all with the Navy and Marine Corps. So people in the Midwest can actually see Capt. Higgins flying a C-130, Navy F/A-18s flying in a demonstration. We may be the only time they ever see anything Navy or Marine Corps-related. Are you adding anything special for the 70th? Hontz: The city of Pensacola is doing a proclamation on the 21st [of March], a big ceremony at the Blue Angeles atrium at the museum there. And then we’re always doing forums with current and former Blue Angels to engage more with the public. They can come and meet current and former Blue Angels and ask questions, just to bridge that gap even more. We want to be very approachable. How does the Navy justify having demonstration teams when money is so tight? Flynn: The connection to the American people — there’s so much talk about how few Americans are actually serving in the military. We just want to make sure that we keep that connection so they know what their tax dollars are going to. The Navy, the Marine Corps, the Army and Air Force spend a lot of money on commercials and things like that, but with the Blue Angels, they can actually look at, and meet and see the service members in action. I would say that commercials don’t inspire people, and that’s what we tend to do. 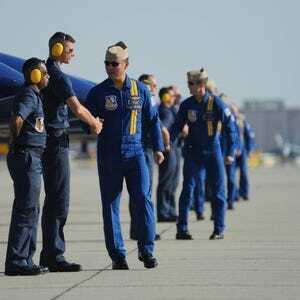 Why are the Blue Angels a good career opportunity, for pilots and enlisted? Schimmel: It’s not just enhancing one’s own career. As our sailors and Marines come here, they’re aware they’re going to be part of a team. And as their level raises here, they’ll be able to take that back to the squadrons and ships they report to in the fleet and in the Corps. Flynn: The reason why we consider ourselves a center of excellence for the Navy is not because we have always the best. It’s just that we give our sailors so much responsibility, because like I said, we only have 130. So we have second class petty officers that have a tremendous amount of responsibility that they might not have the opportunity to get as quickly. Capt. Higgins, you’re the first female pilot – what has that experience been like and what are you looking forward to this year? Higgins: I’m definitely looking forward to this year because I’m the lead Fat Albert pilot, affectionately referred to as M1, or Marine One. It’s really neat to be in a position of leadership, able to put your stamp on the team before you head out to bigger and better things out in the Marine Corps and fleet. It’s been a great experience here. I tell people all the time, it’s more like being in a family than being in a squadron. What was it like coming in after a bombshell report about the previously sexualized command climate? Higgins: I definitely read the [inspector general] report just to be familiar with that, but I didn’t need any sort of warning. I’ve been in the Marine Corps since 2008 and I attended the Naval Academy for four years prior to that, so I have been in a very small female population since I was 17 years old. I knew I was going to be in a professional Marine Corps-Navy squadron, and that exactly what I got when I came here. You know, I wasn’t selected to fill some sort of quota as a result of the IG, or anything like that. The team picks people based off of merit, and I just happened to be the right puzzle piece for that time. I fit the team pretty well, I would say. I’m not trying to toot my own horn or anything, but we work really well together. Cmdr. Flynn, you’re the squadron’s first XO, and your position was established because of that report. What does your job entail, and how has it changed the team’s dynamic? Flynn: When I got here in 2014, I entered a great squadron, a high-performing squadron. I can’t really speak to anything that happened before that. I certainly know about all those events. My experience with the squadron is that everybody was welcoming and extremely professional. In this squadron, I would say the difference is, you can really help out a first-year boss who has two big jobs: He’s a commanding officer and he’s the flight leader. But in no squadron in the Navy does the commanding officer fly as much as the Blue Angels boss. So that’s where the XO and the CMC and everyone comes together to help the boss execute his vision, and doesn’t get overwhelmed with some of the day-to-day tasks. He tells us where he wants to go, and we get him there. And as XO, you don’t fly. Why is that, and how is that different from another squadron? When I was in other squadrons, flying was another duty of mine. But in this squadron, it wouldn’t make sense. You’re really trying to get someone who has the time. If something happens in the squadron when the boss is in the air, there has to be someone there, and that’s why they chose not to make the XO as part of the flight demonstration. But the boss, the flying that he does is so incredible and demanding that that is why I think the XO position has been a good thing, to help with the myriad things he has to do every day. The IG also found that the squadron supported having female pilots. Do you see more joining soon? Higgins: We’ve had several women that have applied with me. I don’t think it’s an impossibility by any means. We’ve had really great candidates, and even this year, there’s been some interest from the fleet from female pilots. Our numbers are very, very low. There are not a lot of female F/A-18 pilots to start with, and again, we’re not looking to fill a quota. So if these women that apply in the future are the right fit for the right team, then they will be selected. But if they’re not, it’s not because they’re a woman, it’s because there’s someone else that fits a little bit better. I think everyone on the team will express the same sentiment, that we’re excited about that possibility and we’re welcoming to it. Do you feel like you’re carrying the burden of that IG report? Flynn: As a person whose position came about in 2014, I would say we always feel that pressure, because we’re representing something we have so much admiration for. It’s funny, I think that one of the reasons this job is challenging is because we feel like we owe so much to the Navy and Marine Corps personnel out there that anything less than doing an excellent job is just not good enough. We carry that gladly. That is something we want to do, but boy, it tests every bit of your professionalism and your character to do so. Higgins: My motivation for the morning isn’t, “Oh, I don’t want an IG. Or I have to live up to whatever the report said.” My motivation comes from those sailors and Marines that are overseas serving, bottom line. Why no female Blue Angels pilots?